A table set in the dining room for just the two of us. Home is our favorite place to celebrate the special day. Click here for original post. 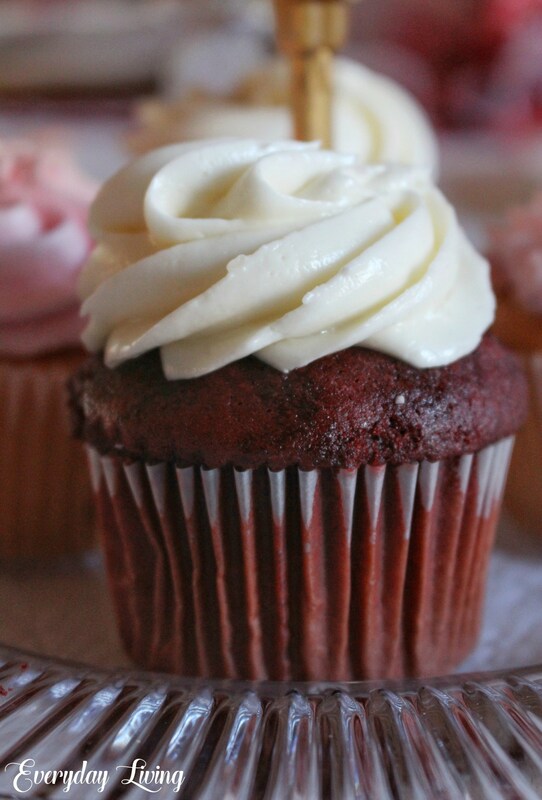 We certainly love sweets for Valentine’s day and My Renaissance Man’s favorite is Red Velvet Cake. The cupcakes are perfect so as not to have an entire cake tempting us. 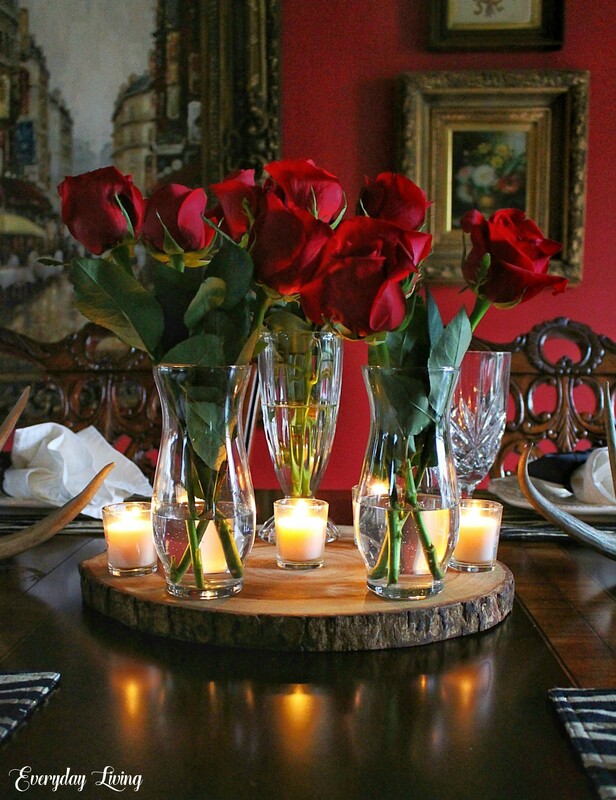 This was a fun table to set, black tie and red roses. Does it sound formal? 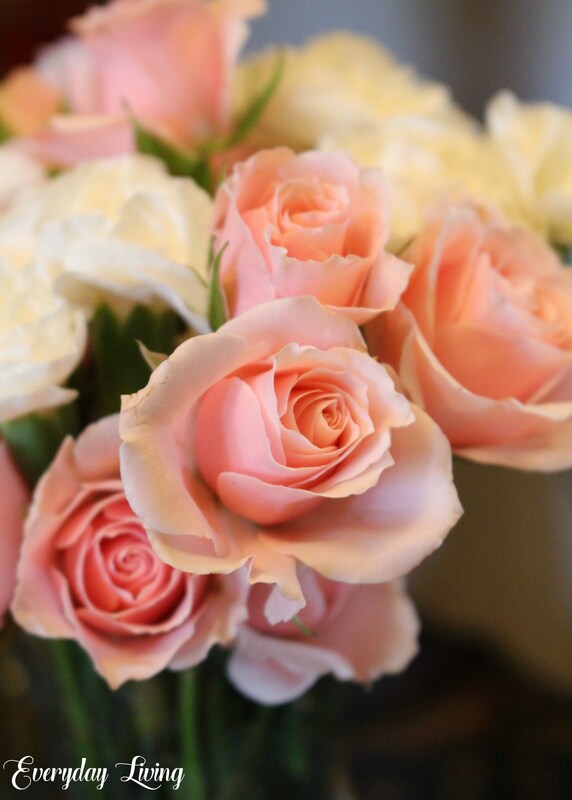 Pink roses are my most favorite for Valentine’s Day. I have a sweet memory from several years ago. Butch had reserved a two night getaway at a lovely and romantic bed and breakfast. When I walked in the room, there were two dozen exquisite pink roses sitting on a desk. Pink rose petals were strewn on the floor and a fire was lit in the fireplace. My man is a keeper, we will celebrate forty six years of marriage on the 23rd of February. Forgive me as I reminisce again. 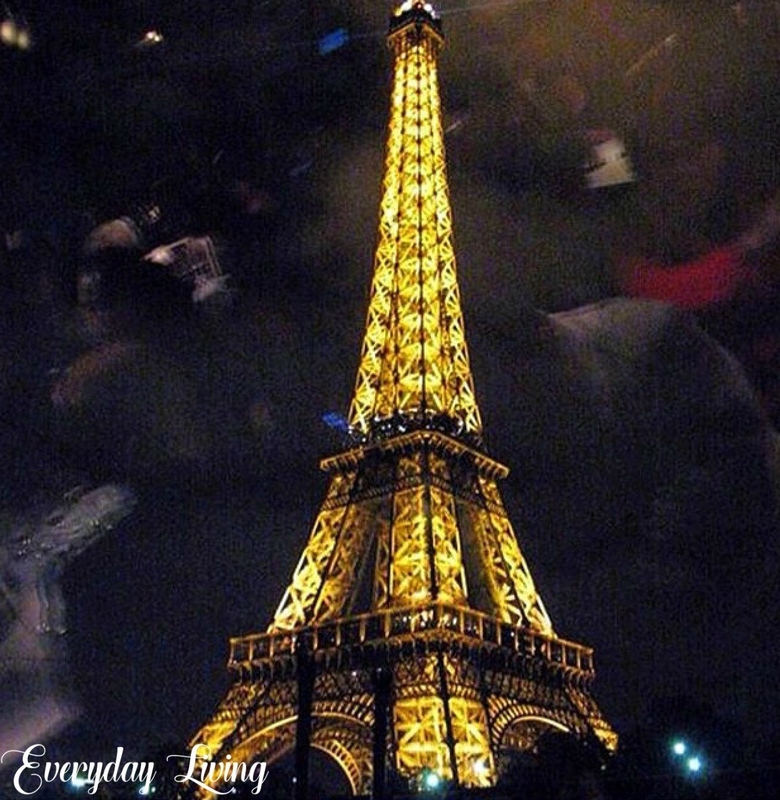 Several years ago on a trip to London and Paris, we had the most romantic Seine River dinner cruise. As strolling violinists played, we enjoyed a delicious meal and this view of the Eiffel Tower. 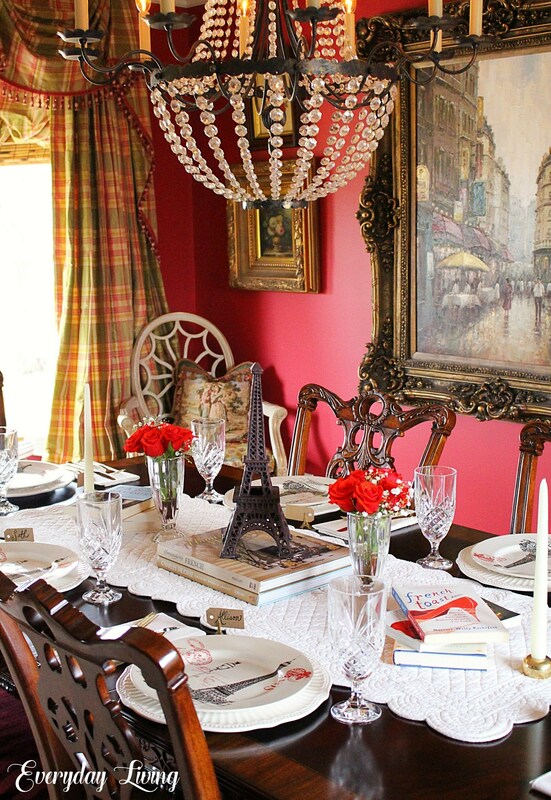 A Paris themed tablescape with seldom used Eiffel Tower dinner plates! Click here for original post. 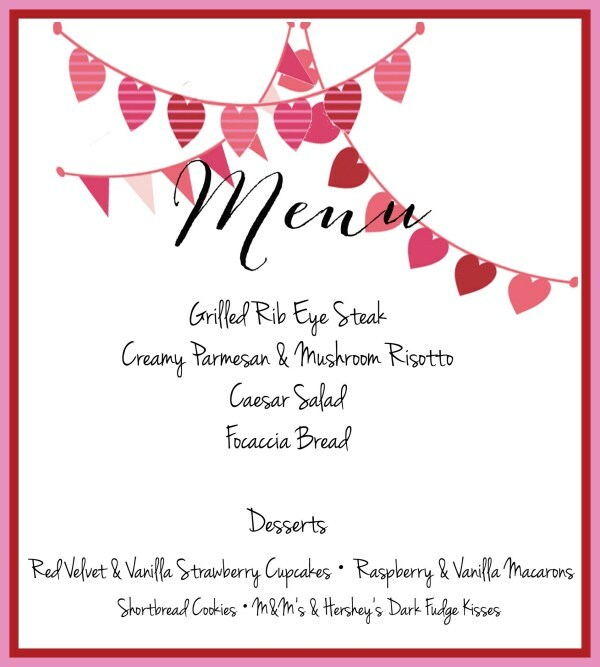 I love planning our menu for our Valentine’s Day dinner. We decided years ago to avoid the crowds and stay home. Candlelight is a must for the special day! A table set for two in front of the fireplace is a great idea. 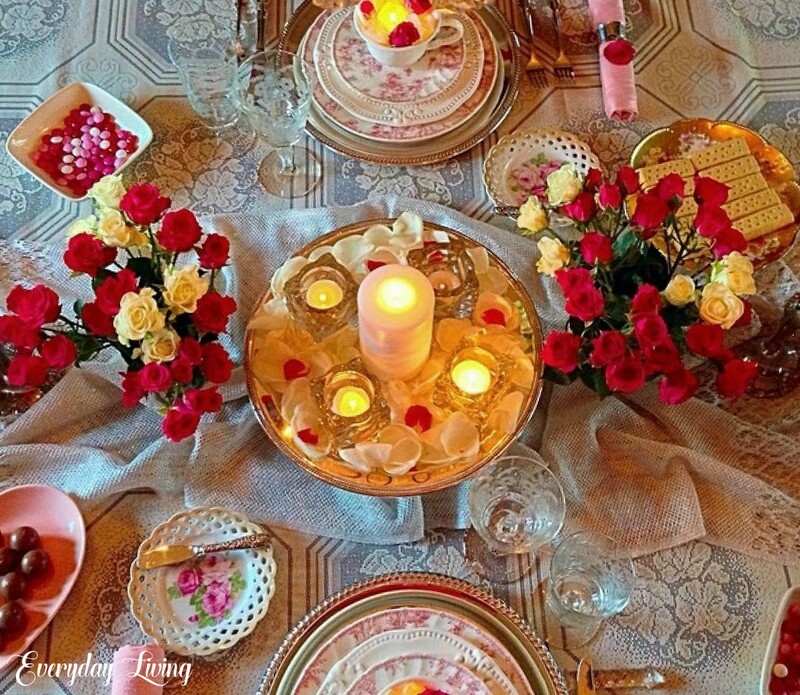 Strewn rose petals and votive candles top the table, with soft music playing in the background! Sound romantic? Click here for original post. However you choose to spend the day, make it memorable! 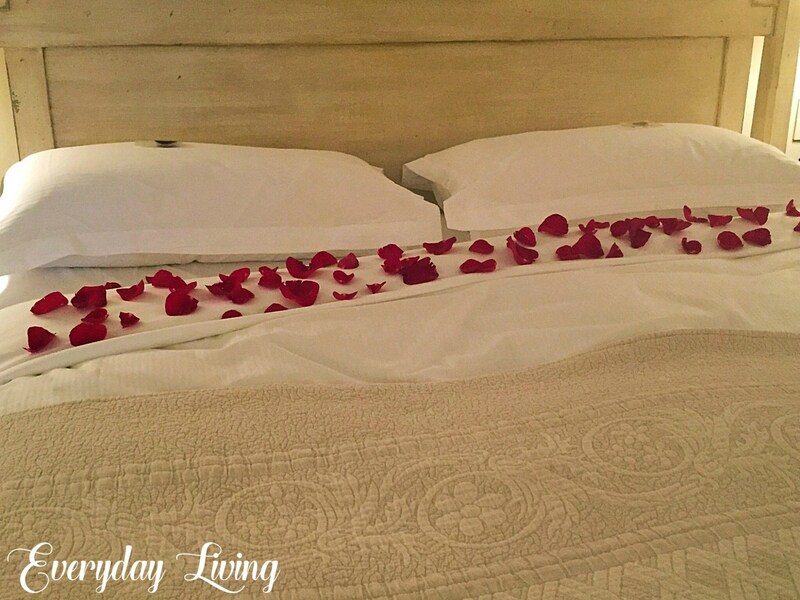 Last year on our anniversary getaway, after an excellent dinner we walked into a rose petal turn down. This is so easy to do at home, and probably unexpected. Thank you for your visits and comments. I hope you feel inspired to make Valentine’s Day special for those you love. 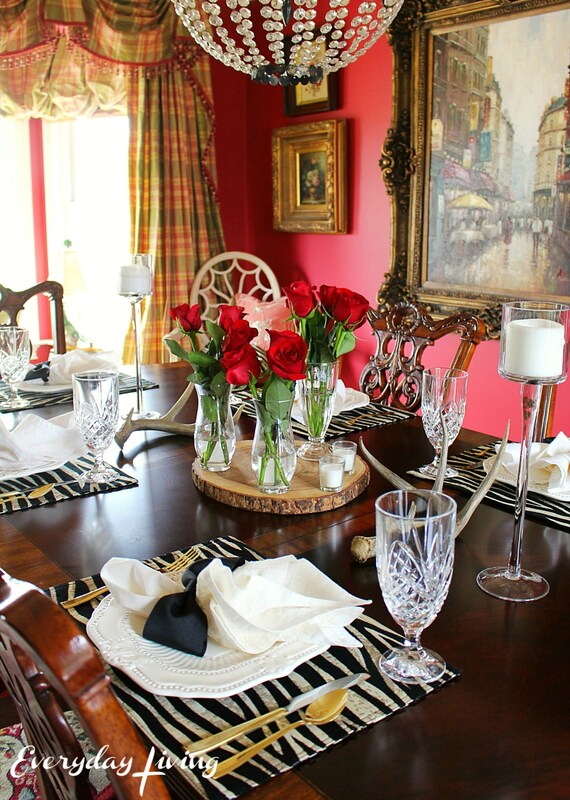 Your new blue dining room is really pretty,but I do love the red. I loved the red, especially at Valentine’s and Christmas, but I needed a change after 15 years. Thanks Anita and enjoy your day. My sentimental self loves Valentine Day however at my very best I would not be able to out do sweet Butch. When all the world is turned upsize down its our loved ones that are there for us, that encourage us, to simply love us. When we let our Lord and Savior chose our life partners our marriages look a lot like yours. I leave your daily posts feeling like all is well with the world. Valentine’s Day is the worst night of the year to dine out in my book, so much better to do something cozy at home! My son’s birthday is Valentine’s Day so we always have a festive family dinner with Valentines and gifts for everyone. I love your black tie and red roses especially! That looks as romantic as it gets. Rick always makes me dinner. We used to go out but found we enjoyed dinner at home more, and it’s always wonderful. He doesn’t have the dish collection I do, but he does a decent job on the table and I love that he puts in the effort to make it lovely. I’ll do other dinners around then too — but that one is always special. Jeanie, how sweet of your Rick to make your Valentine’s so special. Enjoy your day! Roxanne, I totally agree. Love is a choice, not just a feel good feeling. Our culture today doesn’t commit, if things get hard they quit. Thank you, enjoy your day! Wow, this table is a masterpiece! Beautiful! 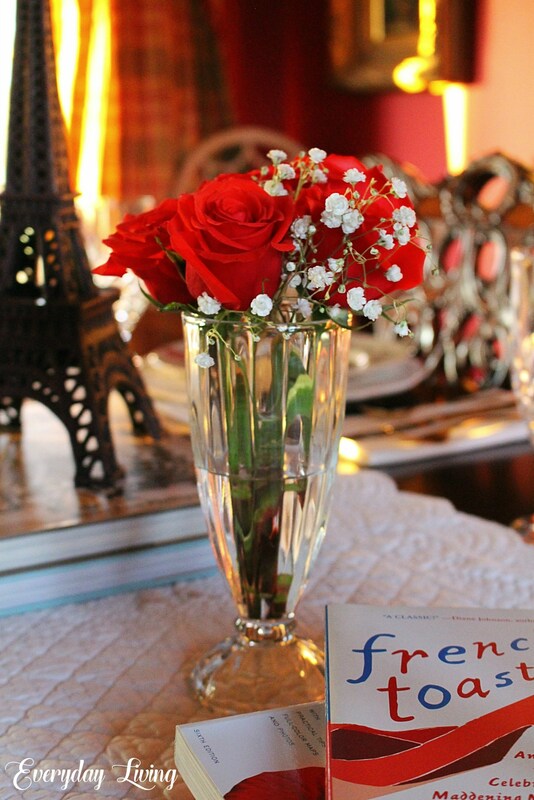 I love the details and such a pretty and romantic table. 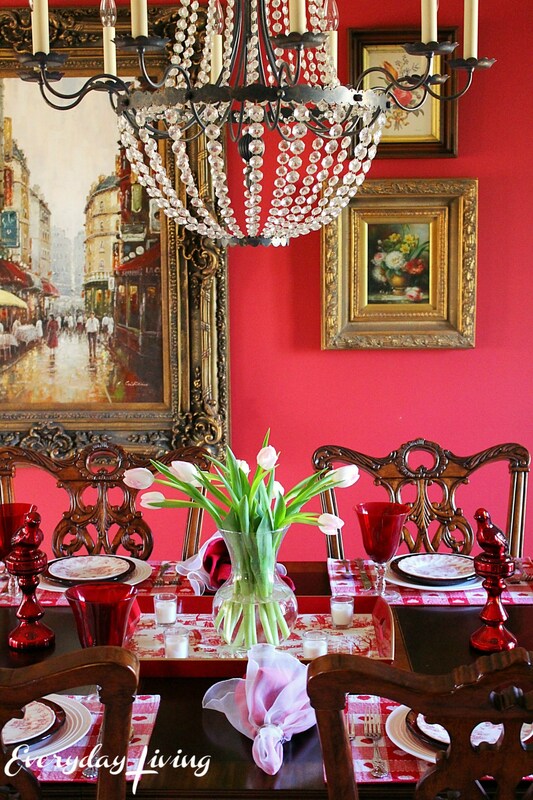 I had to do a double take when I saw your red dining room. It seemed so familiar! Valentine’s has an interesting in our house and it always makes me smile to remember. Wow! Congratulations on 46 years together!! That is just a wonderful accomplishment! And, your anniversary is on my dear Mom’s birthday! May God bless you both with many, many more amazing years together, sweet friend. You are such an inspiration and blessing! We dine in as well. We often cook together… and we make homemade pasta with our pasta machine. So fun! 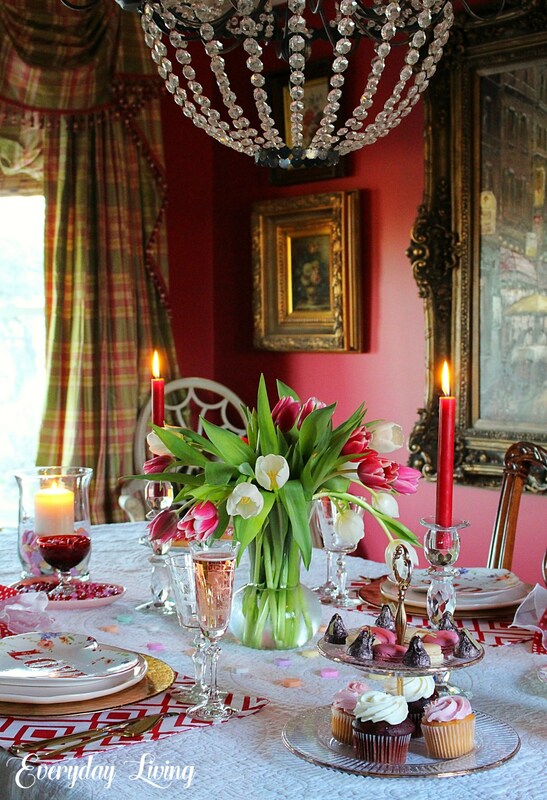 All of your tablescapes are perfect for the Love Day! I enjoy that beautiful set up by your fireplace. So inspiring and beautiful!Here Valentine’s Day is in June.Hugs! 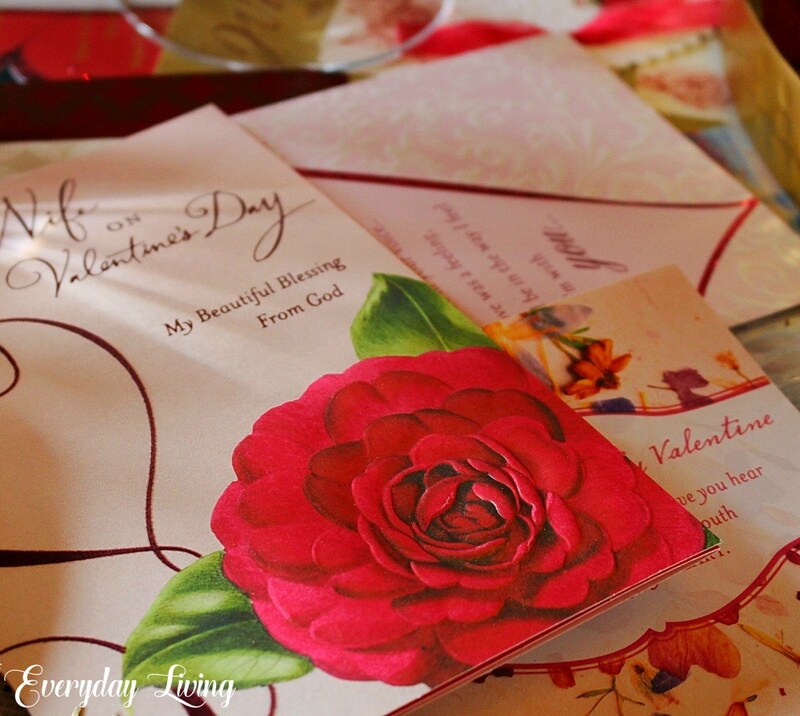 Such beautiful Valentine’s Day inspiration, Pam! 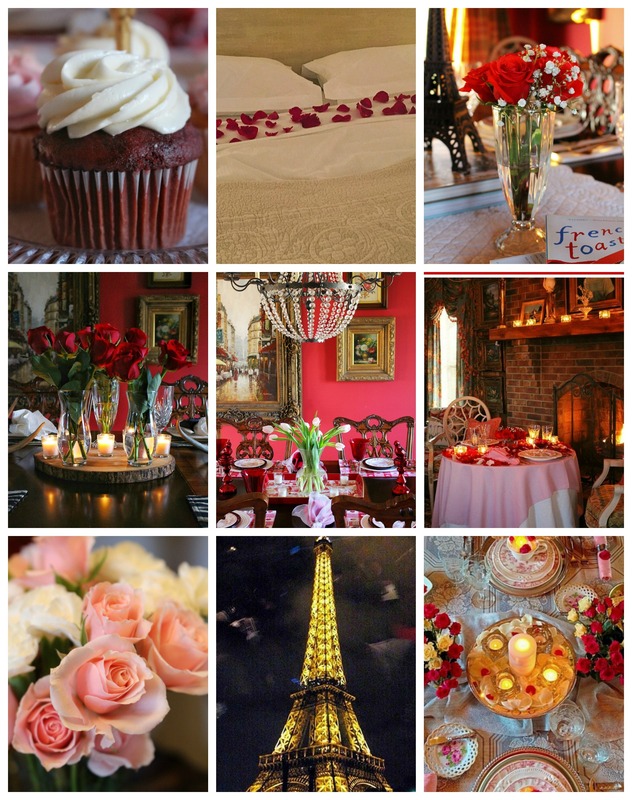 Your tablescapes are always gorgeous, and that red velvet cupcake looks scrumptious! Enjoy your weekend, sweet friend!!! Thank you my friend. Have a warm week! I understand. Take care of yourself Cath. Just beautiful! I love coming to your blog and being transported to such a lovely state of mind! Thanks for sharing at Thursday Favorite Things! Thank you Pam for your visits! Hi again, Pam! Just wanted to let you know I featured this gorgeous post at Thursday Favorite Things today! Such a beautiful post!! Yes, thanks so much Pam for the feature!